Chef Paul Bocuse created the Bocuse d’Or (pronounced "boh-KOOS dohr") International Culinary Competition in 1987 in order to broaden the public’s understanding of the extraordinary dedication, hard work, practice and precision required to execute the very finest cuisine. The Bocuse d’Or competition is the most rigorous culinary competition in the world, held every two years in Lyon, France. Twenty-four countries are selected to compete and each country’s team is comprised of one chef and one commis assistant. Each team is provided five hours and 35 minutes to create one elaborate platter presentation, accompanied by three original garnishes and one plated theme presented in a restaurant manner. The platter and plated theme are presented before twenty four judges, each of whom is among the most esteemed chefs in his/her own country. The judges evaluate the overall harmony of flavors in the dish, the presentation of the platter, the techniques employed and the efficiency in which the teams work. The intensity of the spectator’s enthusiasm is unique. Thousands of fans attend the event and are seated in sections in front of their competitors’ booth, waving flags, singing national chants, and providing general encouragement. The noise level of the arena elevates as the candidates race to complete their presentations to the judges. Hundreds of international photo and film journalists canvas the location, broadcasting the competition live around the world. 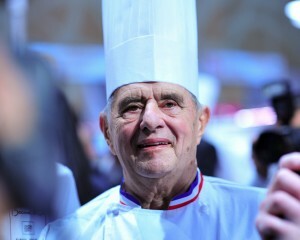 The day following the competition, a breakfast is hosted at Chef Paul Bocuse's infamous Michelin 3-star restaurant in Collonges which includes a ceremony to honor the top three teams by installing a plaque engraved with their names and countries on the front walkway into the restaurant. In 2015, the US Team received the d'Argent (silver statue) at the competition. This was the first time the United States placed at the competition, and previously the country's highest ranking had been 6th place. In 2017, Team USA won Gold for the first time at the Bocuse d'Or, a historic achievement for the competition and for America. There are selection events held globally to determine which countries will ultimately compete in the prestigious Bocuse d’Or Finale in Lyon, France. Currently, there are nearly 60 countries vying to become one of the 24 finalists. A national call for applications took place and from this applicant pool three chefs were selected to compete in the Team USA National Selection. Each chef and his assistant (referred to as a Commis) trained for 3 months to prepare a meat platter and a fish plate within 5 hours and 35 minutes. The Team USA Selection took place in Las Vegas on November 9, 2017 in front of a panel of 12 judges and a live audience. 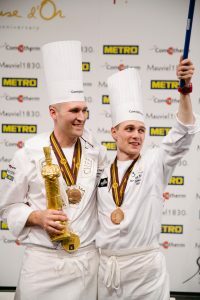 The winning team of Chefs Matthew Kirkley & Mimi Chen were selected to represent USA at the 2019 Bocuse d’Or. Each chef competing is assisted by a "commis" (pronounced “kō-mee”), a junior or apprentice chef position that provides an invaluable opportunity to develop their skills, learn new techniques, and gain experience in the kitchen. Most of their learning happens on the job so a commis must be able to multi-task and handle a high-pressure working environment. The commis chef must also perform many basic tasks of food preparation and organization in the kitchen. Even the most seemingly tedious or mundane tasks are vital to the kitchen’s success. Traditionally during the Bocuse d’Or, 24 teams compete over 2 days to prepare a meat platter and a plated theme. Each team’s president serves on the tasting jury (12 to judge the meat dishes and 12 to judge the plated theme). Every team is evaluated on presentation, taste, and kitchen organization.